“Between the spring and summer styles, there is considerable differences. Those for the spring include the more prosaic tailor-made gowns, cloth jackets, and wraps, with some few dinner gowns and pretty negliges. 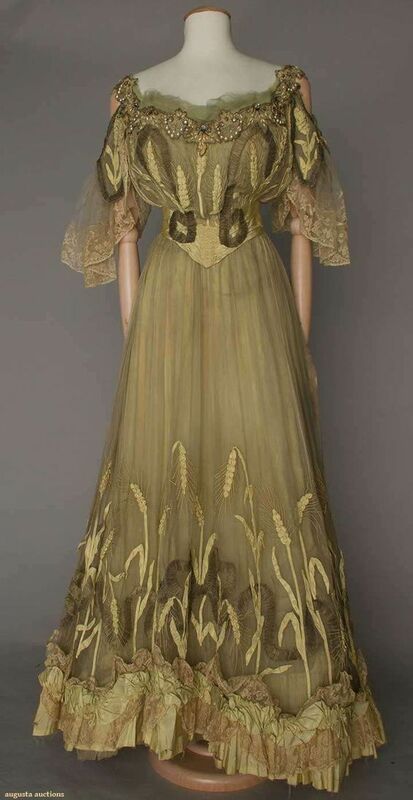 The summer fashions are bewilderingly attractive and include the different styles in the summer silks, transparent material, the more elaborate cloth gowns, and the prettiest ball gowns of the whole year, those intended for midsummer wear. 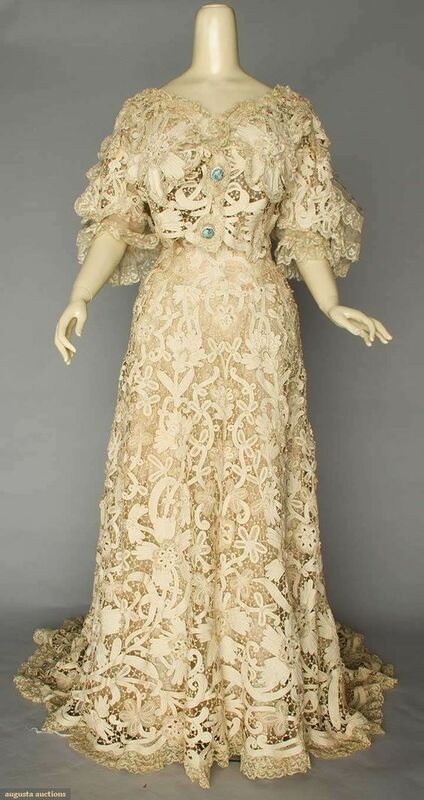 The evening gowns for summer are made of less expensive materials than are those worn during the winter; this season they include embroidered and hand-painted gauzes and nets as well as the spangled lace gowns. 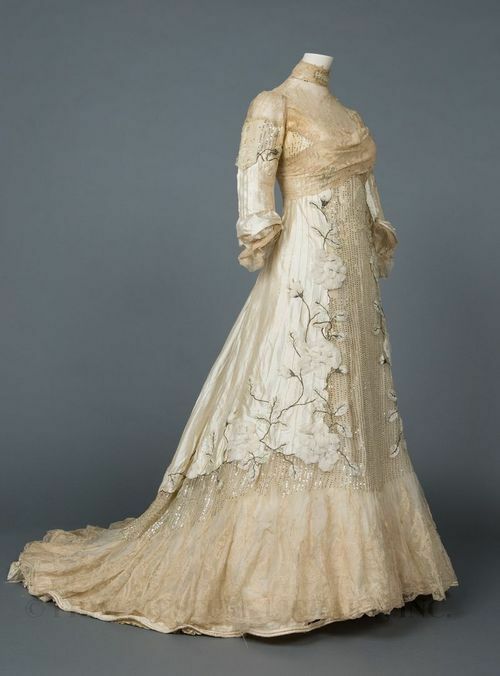 Not to have a lace gown in these days is to be rather behind the age, but it is no longer necessary to buy an entire gown by the piece for the useful lace flounces are again in style, making available many beautiful heirlooms that have been put away for years. The flounces skirt is not always becoming, but at present it is extremely fashionable and is very generally worn. 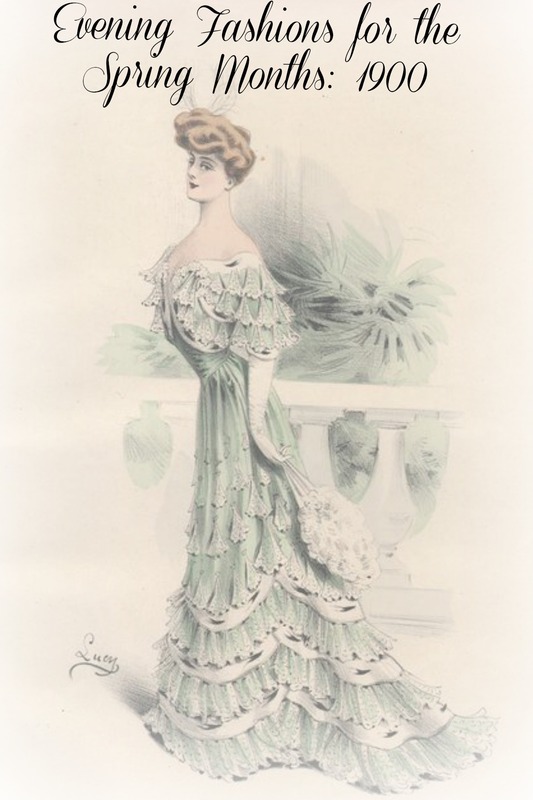 It should have a carefully fitted silk skirt, then the net skirt, on which the flounces are sewed: they are arranged to form points in front and graduated – that is, put on with the points longer in front than in the back, for this gives a more becoming line than when the flounces are put straight around the skirt. These flounces are made not only of lace, but of embroidery, and lace embroidered with spangles of different colors, jet, steel, or silver paillettes, and with cut beads, and the effect is charming. Artificial flowers to trim evening gowns will be much used this summer, and beautiful garnitures are brought out for this purpose. They are put on the gowns in many different ways. 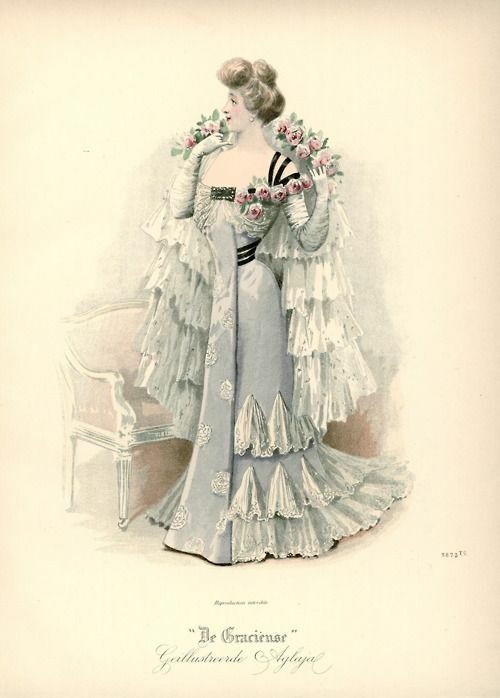 Starting from the shoulder, crossing the waist, and then down over the skirt, the bunches of flowers will be put on with rosettes of velvet at irregular intervals on the skirt, quite in the fashion of our grandmother’s time. Indeed, all the fashions show a strong resemblance to those of two generations ago.